Do Girls Nights Out Vary by Age? So bet you're looking at this picture wondering why the heck does Lori have a stick shoved up her nose? Not something you tend to ask yourself very often since I try to avoid putting things up my nose...like sticks, fingers, pencils...pretty much anything. Anyway, I attended a kick off event last week for the Casual Bloggers Conference they called "Girls Night Out." They had all sorts of fun girls stuff, some of which included make and take projects with the talented Teresa Collins, manicures, lipgloss making, head/hand massages, chair massages and waxing. 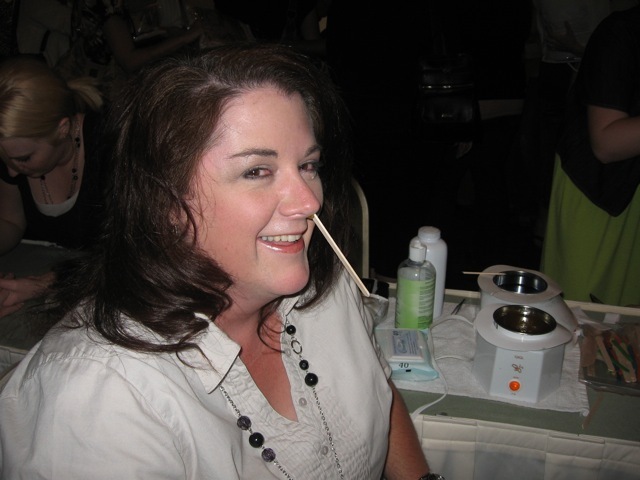 The cute girls doing the waxings suggested to me and my friend that we try the popular new "nose waxing". So Nic and I being the fun and crazy girls we are...we were the first to give it a try. You might be saying OUCH...but no worries, it didn't hurt at all. Although I hadn't really considered the "embarrassment" factor of having a stick with wax on it shoved up my nose while we waited for the wax to harden. And then later wondering if it was wise to remove all the hair from our noses...but that's another story and one I probably won't share. But this little experience made me think...do "Girl's Night Out" celebrations change with age...from dancing and partying to getting your nose hairs waxed. Makes you go hummmmmm! It doesn't hurt like you would think... it happens so quick that it's pretty painless..even less then getting your eyebrows waxed. We did however wonder what issues might arise if you nose hair was missing...haven't really noticed much. I would at least try it once!